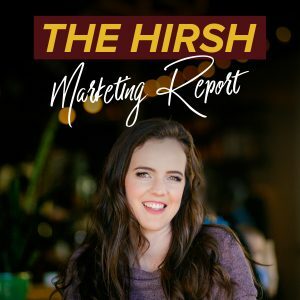 People are attracted to people and emotions, so in this episode, we cover the FIRST step of The Hirsh Process, Strategize, and what this step has to do with your emotional connection with your audience. Learn how to set yourself up for success and identify what most businesses completely miss from the first moment they decide to run ads. 3:06 Your landing page doesn’t even matter if you don’t get this right! 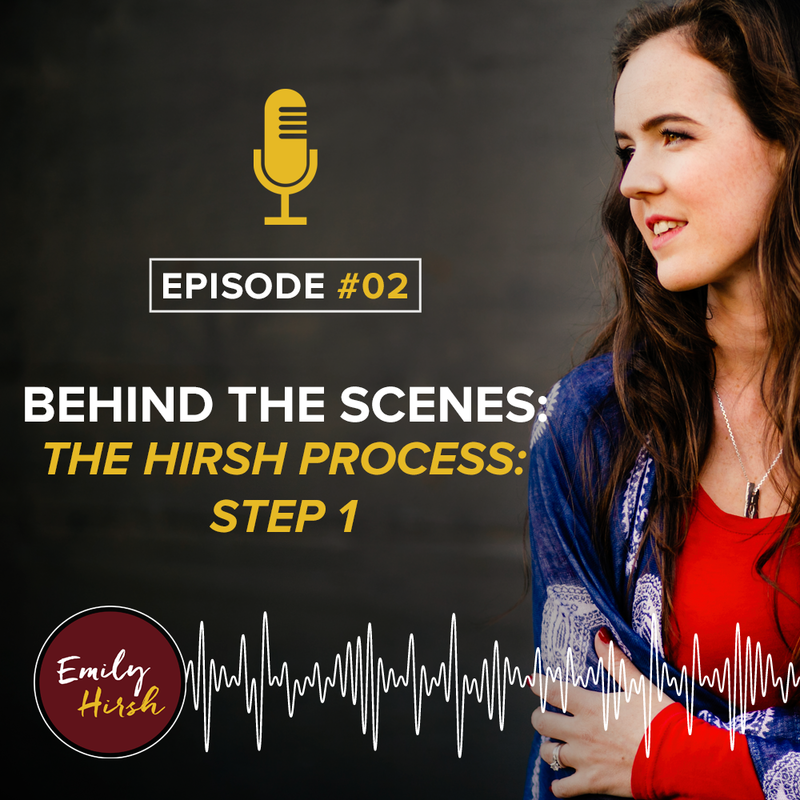 In today’s episode we are going to go over Step One of The Hirsh Process. Step one of The Hirsh Process is Strategize. This is what every single person, regardless if you’re targeting business to business, or business to consumer, or what your funnel is, or how big of ad spend you have, or how big of a business you have, or how many students you have, all of those things don’t matter. Every single person needs to start with this step. Step one of the five step Hirsh process is strategize. This is equivalent to what I would do with a client on a strategy call. All of our clients when they come onto our roster start with a client strategy call. This is where we get clear, we understand what success is, and we make sure we are completely set up for success before we press go on those Facebook ads. During this step and this phase here is what you have to do. There are really three main pieces, plus understanding your funnel. The first two go together, and this is really what I would say is branding. Some people think that they know this, but they don’t. They get on a call with me and I ask these questions, and their answers are very surface level and we have to really get into detail. As I go through this, and after you listen to this, I want you guys to go and do this later on. The first question you need to answer is who is your market and do you have a deep understanding of who they are so you can connect with them emotionally in your Facebook ads and your marketing. This means really … And it sounds cliché. Every time I say it I’m like man I remember hearing this when I was growing my business and I was like duh, I know who my market is. But really truly understanding who are those people that you want to target. What are they going to be thinking, and doing, and experiencing, and worried about, and happy about, and all of the emotions while they are scrolling the Facebook or Instagram news feed? Can you answer that on a very deep, deep level? This might take a couple weeks of pondering. Most likely if you have a business and you’ve sold product or services, you understand this question. In that case, it might be talking to the people that you’ve already sold to, and the customers you already have so you can really understand who they are and those emotional connections with them. If you don’t have that, you will not be successful with your marketing. People are attracted to people and emotions, and when they can get a response out of you, or you get a response out of them with your marketing, you are so much more successful. This is really important for the very front end of your funnel, which is your Facebook ads. It’s very important. That’s the first question you need to be able to answer on a very deep level. Put yourself in their shoes, deepest darkest places of their mind. Do you know who you are targeting because you can’t be successful with your ads unless you know that. Then number two, the question you need to be able to answer after that, is what problem are you solving, and can you consistently convey that problem across all of your funnels in marketing so you are always attracting the right person. Can you always be solving the problem or problems that your market or your audience having through all of your content? That doesn’t just mean from your one product or sale or service. That also means in the Facebook lives that you put out, in the options that you create, the webinars, everything that you put out there. Is it consistently attracting the same person with the same type of issues or things so that you’re able to brand. If your specialty is teaching moms how to start a business, all of your content speaks to that and it’s not confusing. Or if your specialty is teaching men how to get healthy again later on in their life, all of your content speaks to that and it’s not distracting or confusing about who you are. If you can do that very powerfully and very consistently, then you will be able to build not only money from your sales funnel, but a consistent brand of the right person. If you have multiple businesses, or multiple products, or multiple ventures, I really encourage you to focus on one. I made that mistake, a lot of my clients have made that mistake, but I can’t emphasize it enough, make your marketing congruent. The third question you need to be able to answer in this phase, and this is what often times … A lot of times with a strategy call I am getting a deep understanding of those two things for our clients so that our creative team can go and do their job. A lot of times the clients already have these answers, we just have to pull it out of them, especially my creative team. My copywriter has a specific call with the clients to understand those deep emotional things and the problems that our client’s content is answering so that we can speak to that in the marketing. Because most likely your Facebook ad itself, whether you have a video, or text and an image, whatever it is, it’s convincing the person to click. Your landing page doesn’t matter if that’s not good, and you need to really stand out, especially in some of our niches like business to business spaces. The third thing people need to do, and this is so, so important, is you need to be able to answer what is your end goal and what is success in your marketing. When I say that, I want you to be able to answer specifically with numbers that you can track what success means. That means working backwards and starting with okay if I want to sell 100 courses, how many leads do I need to get in the door to sell that many courses, how much am I going to pay per lead, and what’s my ad spend to achieve that. You need to be able to answer this and understand this on a really deep level. Not even deep level, clear straightforward, easy to answer the question. Because if you don’t, you’re going to start your ads and you’re going to feel like I don’t know if this is working or not. So we will not start ads unless we are able, we know what’s the ad spend that we have to spend to reach the end goal, which is sales. If you don’t know what your end sales goal is on whatever it is you’re selling, figure it out, or at least set a goal because why else are you running ads. It’s not just about the leads. If the leads aren’t quality and the leads aren’t buying, you’re wasting money. Immediately you need to be able to know what is success. Let’s use the 100 course sales as an example here for a second because it’s an easy number. If I am going to sell 100 course sales, and let’s just say 1% of my list is going to buy because it’s a $9.97 product. That means that I need 10,000 people on my list right to sell that many courses. Let’s say I pay $2.50 cost per lead, so my ad spend is $25,000. If I’m going to sell 100 courses at $9.97, I’m going to make $100,000. Pretty realistic, especially if it’s a first launch to spend about 25% of your money that you make in your ad spend. 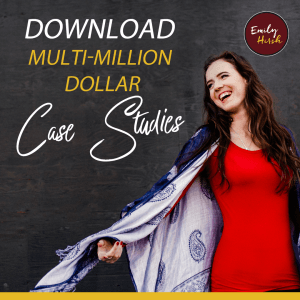 Now if it’s not your first launch, or if you have a higher sales percentage, let’s say you sell to 2% of your list, you only need 5,000 people on your email list, you pay that $2.50 cost per lead, that’s $12,000 to make $100,000, pretty good ROI. But what most of the time happens in this phase with people is they had a completely unrealistic expectation and they thought I’m going to sell 100 courses and I’m going to spend $10,000, or $5,000 my very first launch to make $100,000. I go through this with them and I say no, that’s not possible. A lot of agencies and ads managers, and people out there who claim to be experts are not doing this. What’s happening is the client then feels like it’s not successful, or they’re being promised something that is not possible. Of course there are anomalies, and there are people who convert really high, but if you have no data, if you don’t know how your things convert, then how are you going to know this. If you do have data, use that data. If you launched before, go back and look at what percentage of people on your list that bought. Then you have that data that you can go off of that. This is what we do time and time. We’ll get into this in step five, but time and time again is use that data to perfect our results and project our results so we can scale. So before you turn on ads, you have to be able to answer the question of what is success with my ads in numbers. How many leads, how much money do I have to spend to get how many sales? Then every day, this is what we do, is we track against those numbers and we look at how much of a percentage are we to our goal. Way too many people do not do this. I have had very successful clients come to me who have worked with big agencies, or spent a lot, hundreds of thousands of dollars on their ads, and they don’t know how to answer this question to me. What they’re doing is just spending money with no real data to back it, which is one of the worst things you can do. Those are the three questions that you need to be able to answer in this phase one, strategize. The final thing you need to do is you need to make sure you have your funnel and your customer journey mapped out very clearly because you’re going to need that as we get into step two and three. If you’re doing a webinar, make sure you understand is there urgency, how many days is the offer from the webinar, how many emails, is there a nurture sequence where you’re going to be selling to them again. All of those things matter because what you do with The Hirsh Process is you time your ads with that customer journey. When a client or a customer, or a lead is going through an email series, we can have re-targeted ads that are timed perfectly with those email series. We’ll get into that more in step four, which is make money, but in order to really do this right you need to be able to answer who is your market and that deep understanding of them, what problem are you solving, and then looking at all of your content, is it congruent and answering that problem or problems, what is your end goal, and what is success with your marketing in numbers, in trackable daily, you’re able to track them numbers what is success. Then is your funnel mapped out. That’s step one. That’s strategize. That’s what a client would do personally with me in a new strategy call working with us in our agency. That’s what I want all of you guys to do today if you have not done this. If you have ads live, go back and do this. It will be so eye opening, especially the numbers piece. If you want to work with an agency and get done for you strategy, if you go to helpmystrategy.com you can book in a call with Team Hirsh and get on a strategy call where you can do that with me and then work with our amazing, amazing team who works with some big influencers and people out there in the space. Thanks so much for tuning in today you guys. In the next episode we will do Step Two of The Hirsh Process.